Slimy syncretism slithers deeper into spiritually spineless evanjellyfish every day and despite dwindling funding Apprising Ministries continues to point it out for you wherever we find it. You just can’t make this stuff up. Think about it; who would have ever thought that Oneness Pentecostal heretic T.D. Jakes—a top superstar in the corrupt camp of Word Faith prosperity preachers—would be mainstream. We are thrilled to announce that T.D. Jakes will be joining us at Elephant Room 2. I also told you Jakes is “Chief Pastor” of a church called The Potter’s House (TPH). He has also long been said to be a Oneness Pentecostal, which would mean that T.D. Jakes denies the cardinal doctrine of the Holy Trinity. Here I’m simply going to give you the evidence to establish this charge is true. There’s actually quite a bit of information there. I can tell you from my many years of personal reasearch and study that almost invariably when we see the word Apostolic in the name of a church it is Oneness Pentecostal. It should also be noted there are more than a few of such within HGAAA as well. Here Jakes does tell us of his “association with Oneness,” which is heretical in and of itself. He also says HGAAA “differs in many ways from traditional Apostolic,” i.e. Oneness aka Jesus Only, churches. This is essentially an admission on Jakes’ part of his acceptance of the Oneness Pentecostal position. I believe in one God who is the Father, the Son and the Holy Spirit. I believe these three have distinct and separate functions—so separate that each has individual attributes, yet are one. I do not believe in three Gods (Online Source, emphasis mine). It also needs to be pointed out that nothing Jakes said contradicts modalism or commits him to the orthodox doctrine of the Trinity. Theologians recognize two distinct conceptions of the Trinity: the ontological Trinity, which refers to the existence of three distinct Persons within the Godhead apart from any relationship to the creation, and the economic Trinity, which refers to the distinct roles the three Persons assume in relation to creation. You also saw above that today, even many years later, T.D. Jakes still uses the language of modalism aka Oneness Pentecostalism. I have said before, it’s little wonder why Jakes avoids quoting “even theologians who agree with” him; likely because of those of us who study Comparative Religion. We would immediately recognize that modalism they would be defending, and which, is even contained in the vague explanation of his personal beliefs. As I close this out, for now, we turn to The Man, His Ministry, and His Movement by Jerry L. Buckner and his Concerns About the Teachings of T.D. Jakes. The meaning of the term Trinity, according to historic Christianity, is that within the nature of the one God co-exist three equal and eternal persons — Father, Son, and Holy Spirit. T. D. Jakes Ministries and historic Christianity both use the word Trinity, but the meaning of the word appears to be different. 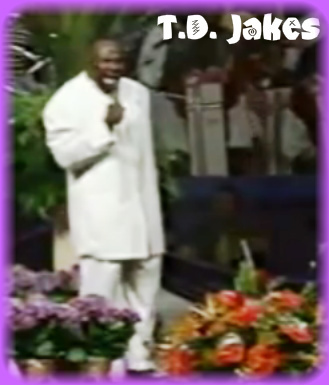 The position taken by T. D. Jakes Ministries remains problematic. The problem lies in the word “manifestation.” Manifestation is a modalistic term often used by Oneness Pentecostals. Modalism views Father, Son, and Holy Spirit as different modes of God’s activity rather than three separate persons. I have stated elsewhere that my first area of ministry as I entered the fields of apologetics, counter-cult evangelism, and Comparative Religion 24 years ago was Oneness Pentecostalism; so, from having specifically studied the mythology of David Bernard, I can tell you Buckner’s salvo is dead-on-target. First we need to do some major league education on what the doctrine actually teaches….In the second place, we have to impress on every believer the vital importance of understanding, accepting, and experiencing the truth that God has revealed Himself to be Triune: Father, Son, and Holy Spirit…. a doctrine must be regarded as fundamental if eternal life depends on it. Scripture is full of statements that identify the terms of salvation and the marks of genuine faith.